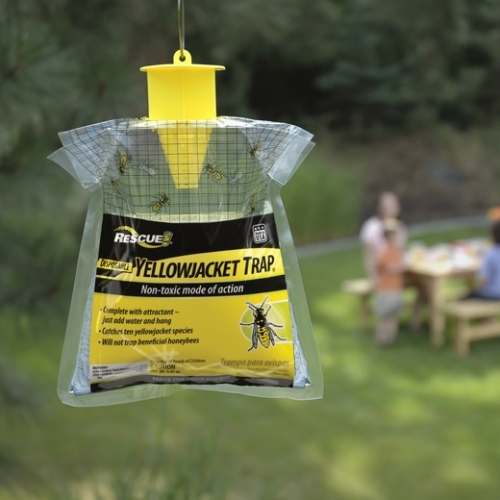 Like our reusable trap, the RESCUE!® Disposable Yellowjacket Trap features the same powerful attractant as well as a handy disposable bag for additional ease and convenience. Simply add water to activate the powdered attractant - the insects simply won’t be able to resist its lure. Once inside the trap, yellowjackets drown in the water. RESCUE!® Disposable Yellowjacket Traps are great when you’re on the go. They’re ideal for picnics, outdoor barbecues or campsites. Hang the traps in a bush or tree at least 20 feet away from your outdoor activity area. Use the RESCUE!® Disposable Yellowjacket Trap in the summer and fall when worker yellowjackets out foraging for food are particularly attracted to the moisture in the trap.